Internationally renowned artist Mirei Oshiro's works are on display starting Friday this week at Okinawa Market’s Camp Foster Concession. 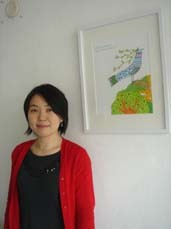 Fresh off from her Paris Exhibition the native Okinawan has been making a splash in the art world since her first Okinawa Exhibition in Tokyo in 2003, moving around Okinawa and the mainland with her Sketch Mirei exhibition in 2004, Journey Exhibition and Sun Flower exhibitions in 2005, a T-shirts Exhibition and Mirei Sweet Exhibition in Okinawa in 2006, an Art Picnic and Cre Aid and Mirei Oshirio Atelier Exhibition in 2007, and a trifecta of 2008 events. Read More!